The Fitbit Ionic is the company's first ever smartwatch, taking in all of the goodies from fitness trackers like the Charge 2, Alta HR and Flex 2 and adding new features like Fitbit Pay, an onboard music player, an app store and battery life that wipes the floor with the Apple Watch and Google's Android Wear collection. We've spent plenty of time getting to know the Ionic now, so we wanted to share some useful tips and little tricks for when you get your hands on your own Fitbit smartwatch. Got any questions about anything we've included below? Let us know in the comments section. So we are going to start with something simple, but no less useful to know. If you want to preserve power and power down the Ionic, it's really easy to to. Go into the Settings apps on your Ionic and select About then Shutdown. Hit confirm to switch the smartwatch off. If you want to power it back up, it's a simple case of press any physical button to awaken it. The Ionic performs pretty well on the battery front. Fitbit claims it's possible to get up to five days, and in our testing we've comfortably managed to get around four days. If you do want to increase the time that you have before you need to reach for the charger, there are a couple of simple things you can do. The first is to turn off continuous heart rate monitoring, which you can do from the Settings menu on the watch. Our other power saving tip is to turn the 'Always-On' watch mode off when you are tracking exercises. You can do this before you start logging an activity by tapping the settings cog icon and scrolling down and turning off the 'Always-On Screen' mode. You can select up to seven exercise activities that can be tracked directly from the Ionic, and as a default they are running, cycling, swimming, treadmill running, weights, workout and interval workouts. You can also add additional activities including yoga, spinning, golf, pilates, circuit training and even kickboxing. However there are still more we'd like to see in the future, like rowing and skiing. You won't get the same level of tracking as running, cycling and swimming, but it will record useful information like heart rate. To switch things up, go into the Exercise Shortcuts menu on the phone app and tap Edit to remove and replace activities. Once the Ionic has synced with the changes you should now see the new activity screen(s) appear. 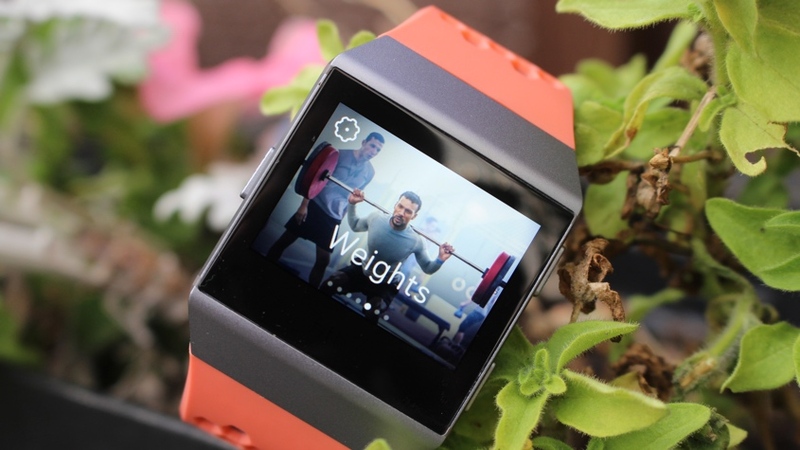 Fitbit's App Gallery is now open for business, meaning you can now download third-party apps onto your Ionic. Unlike Android Wear, you can't download apps from the watch itself, just the smartphone. The app store isn't anywhere to be seen on the dashboard, so you need to tap onto your Ionic device in the top left corner and then tap on Apps. You will then see a list of apps to browse through, and to download one you just need to tap one and then tap the pink 'Install' button. Once you've downloaded an app you'll see it under 'My Apps'. Worth checking here and seeing if there are any app settings you can tweak, which will be signaled by a cog icon to the right of the app name. If you want to update your watch face, you'll find 'Clock Faces' next to Apps on the same device dashboard. Folks in the US have the option to subscribe to Pandora and sync their playlists with the Ionic, which is pretty cool (though sadly no Spotify support), but if you don't want to do that, you can just sync your own music files too. Click on that link above for a guided walkthrough, but essentially you need to download Fitbit's desktop app (available on PC and Mac) and head to the Media section in the Fitbit app, which you'll find in your Ionic settings. In order to listen to music on your Fitbit Ionic you'll need to pair it with Bluetooth headphones. The good news is that it will pair with any Bluetooth headset. To do so you need to go to Settings on the watch itself, scroll down to Bluetooth, and then add a new device. As long as your headphones are in range and discoverable, it should pick them up and then keep them in memory. This one comes up a lot. Though Fitbit makes it pretty clear that the Ionic is waterproof, there are naturally going to be questions about just how waterproof it is. The Ionic is water resistant up to 50 meters in pool, ocean, shower or rain. So you're fine taking it into the sea, though Fitbit recommends cleaning it after an ocean swim to prevent salt buildup. The Fitbit app does a pretty decent job of serving up the information you need to know, but if you want to take things further and closely examine running data, you can export the raw data to be used in other analytics applications. This tip requires going to the web dashboard and the Settings menu as described above and going to Data Export. Here you can pick the time period of data you want to export (up to 31 days), the type of data and pick the file format. Hit download and you can start crunching those numbers. Away from core tracking modes for running, cycling and swimming, there is dedicated tracking for when you want to burn some calories with a session of high intensity training. To set up intervals and rests in between, you'll need to go to the Fitbit app first and then head to the Exercise Shortcuts menu. From there select Interval Workout and then you can adjust the times as well as the number of times the intervals should be repeated. The Ionic will buzz to indicate interval and rest periods. You may have heard that Fitbit has a relative SpO2 sensor on the Ionic, which it says will be used for detecting sleep apnea. However we're several months into the Ionic's life and still there's no sign of it. If you've been eagerly digging around the app in hope of finding it, we're afraid to say it's not yet there, but rest assured, Fitbit promises it's coming soon. At launch, there isn't going to be a great number of third party apps available but one we are glad to see is Strava. The sports tracking app will allow you to record activities like runs and rides using the Ionic's onboard GPS and sync the data to the platform. There's also a nice Matched Runs feature that will compare data from routes you covered more than once to see your progress. To get the two apps playing nice together you'll need to go to your Fitbit app on your phone, and head to the app section in the Ionic's menu. Select the small cog icon next to the Strava app and that'll push you into the Strava web app where you'll need to log in and authorise Fitbit to sync with Strava. When you go back into the Fitbit app, the Strava profile should now indicate that the app is now authorised to share the information. If your Fitbit smartwatch is playing up there is a way to give it a reboot, which can often get it working again. To do this, hold down the physical button on the left side of the watch and the bottom right one on the opposite side together for a few seconds. The screen should go black and then you'll see the Fitbit icon flash up to indicate that a successful restart has been completed. If that restart doesn't do the trick, you can also perform a full factory reset that will delete all settings and data from the watch completely. So make sure you want to do that or you sync your data to the app before doing this. On the watch, head to Settings and swipe all the way down until you see About. Scroll down again until you see Factory Reset and get ready to take things back to when you first pulled it out of the box.